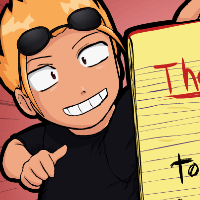 Easy Web Design Tips for Webcomics | Cat Nine: Take Two! For some reason, people neglect the “web” part of webcomics. Don’t! I understand it isn’t as fun as working on the comic, but it should be considered an important part of the webcomic itself! Think of your favorite comic book or graphic novel(if any), you wouldn’t have bought it if the packaging’s crappy, right? Web design doesn’t have to be hard, that is, if you follow these tips. Start with the necessities. There are really just three things you need in a webcomic website. The rest is just gravy. The comic – People came here to your site for the comic after all! First, you need a website or the skills to make the website update automatically. Blogging platforms like WordPress or one of those webcomic hosting sites will work. Thankfully, most of them have what a webcomic needs. Site navigation menu – Home, Archives, and Contact(email) should be the minimum. Comic navigation – Links going to the First Page, Previous Page, Next Page, and Latest Page. Arrange them like so, and for god’s sake, don’t call them something else because you’ll just confuse the readers. For buttons, arrows work the bes- no, actually, only use arrows or something else that’s appropriate. A header or logo – So people know it’s your comic. Make comic navigation noticeable. Don’t let readers work by putting your comic navigation menu somewhere out of place or unexpected. Make them obvious, and stick them on top and/or bottom of the comic. Design the website around the comic. It just makes sense to base the website design on the comic. For example, using lots of black, whites, and grays is appropriate for gritty noir comics. Meanwhile, bright colors combined with rounded shapes is perfect for comedy or cartoony comics. As always, the simpler it is, the better. Avoid pixelated images. When exporting an image file, make sure it’s not pixelated. Avoid using JPG because it’s prone to pixelation and for photos. PNG is the best for most situations, while GIF is alright for black and white or comics with small amounts of color. Keep comic sizes appropriate Large images take forever to load; remember, not everyone has blazing fast Internet. If you need to scroll in two directions (horizontally and vertically), then your comic might be too big, and it’s too much of a pain to scroll that much. The best image size should be able to accommodate any screen size, and load fast too. That’s usually dictated by the current trend in screen sizes. Clicking on that link, it says “As of today, 90% of our visitors have a screen resolution higher than 1024×768 pixels”. Website backgrounds. For me, the background should make the comic stand out, and/or designed around the comic. A simple colored background will often do, but avoid overly bright and saturated colors! That’s going to tire everyone’s eyes after a while. Otherwise, a gradient or pattern will work. Focus on your comic. I find it distracting when there are filler, extra, or guest comics/pics in the main comic. That’s why I dump them in the blog, chat, Twitter, gallery, or deviantArt instead. Use different browsers. Test your website in different web browsers. It might look perfect on one, but it might look horrendous in another. For an example, check the character page in Chrome, and then Firefox/Internet Explorer. Yeesh. And no, I am not fixing that. Use CSS for most of your web design. This is more for people who know enough HTML (how to make webpages). If you don’t know CSS, it’s really easy and worth it to learn about it! Here’s an easy-to-understand CSS tutorial by W3 Schools. No flash sites. Bad idea because it might not be compatible with other devices (ehem, IPhones) and they’re sooo last year. It’s also hard for search engines like Google to crawl flash sites. There’s only one exception to this rule. No sounds and videos playing. If you put videos or audio files in the website, make sure none of them play automatically. That’s gonna annoy a lot of people! No splash pages. It might just be me, but it’s kinda annoying if you went to their homepage but the comic isn’t there. If I need to click on something like “Read comic”, I die a little inside. Usually, it’s because they have a blog or want to generate additional traffic for ads. Stick to a few fonts. The site will slightly load faster and make it less confusing. Same goes for the comic itself; I know it makes sense to use different fonts for each character, but no, it’s a little jarring. Also, don’t use Comic Sans even if I’m guilty of this myself! Better to use another comic font since there are tons available like the font I’m using. You can create your own font, but I have no idea how to do that yet. Buttons and feedback. Mousing over buttons and links should have some sort of reaction. Not necessary, but quite nice. Adding more stuff? If you’ve decided to add more pages or links, here are some suggestions. Forums. Unless you have several readers already, your comic probably don’t need a forum yet. Just look at the poor, poor forums for Cat Nine as an example. Riddled with spam(since removed) and ohmygodimsolonely. If you’re starting one anyway, always require log-ins and captcha because you will be spammed. Character/cast page. Some info about your characters might be nice, but don’t let it become an Abandoned Info Page. About page. Tell people about yourself and the comic! Extras. Dump your wallpapers and extra art here. FAQs. Here you can post about frequently answered questions so people don’t have to bother you. Fan area. Meanwhile, you can dump fan related stuff here. Fan fics, fan comics, fan art, hurray! Social media. Facebook, Twitter, and maybe Tumble is all you need. Personally, I find Twitter the most useful, but some extra exposure is handy. Chatbox. A good replacement for a forum and allows you to chat in real time. Advertisements. Money is good! Money is awesome! Make sure to put them somewhere easily seen so it’s actually useful, but too many of these are bad. one to three should be enough. Comic Ranking and Voting. A lot of webcomics like putting their ranking to encourage people to vote, and maybe stroke their egos, but that’s alright. Oh, and ehem, please vote for us! Donation. You probably won’t earn enough until more people read your comic, but hey, someone might be feeling generous enough, wink wink. Shop. If fans are willing to buy comic-related stuff, then let them! Links to other comics. A bit of “scratch my back and I’ll scratch yours”. Recently, the best way to do this is by using inkOutbreak (has been dead for a long time). Transcription. It’s really only there for the SEO benefit, but it can be used for translations, specifically, Google Translate boxes! Welp, that’s all in my mindhole right now. If you have any suggestions or additional concerns, feel free to tell me! Found this useful? Then please share/like/donate!